Firstly I would like to thank those of you who joined the conversation in my previous post “shall we wear purple?” Not all of us agree about liking and wearing a certain colour and that is fine. We are all individuals with our own preferences often based on our personal histories. This is all part of the rich tapestry of life. Also, colours do have psychological, religious, social and personal associations. A couple of you referred to these in the comments. A few of you mentioned that you wore colours that you liked regardless of fashion trends or what others thought. I heartily agree with this sentiment, even though I trained as a colour and style consultant way back in the early 90s and worked in the industry for over twenty years. I feel that when we reach a certain age we are entitled to please ourselves. 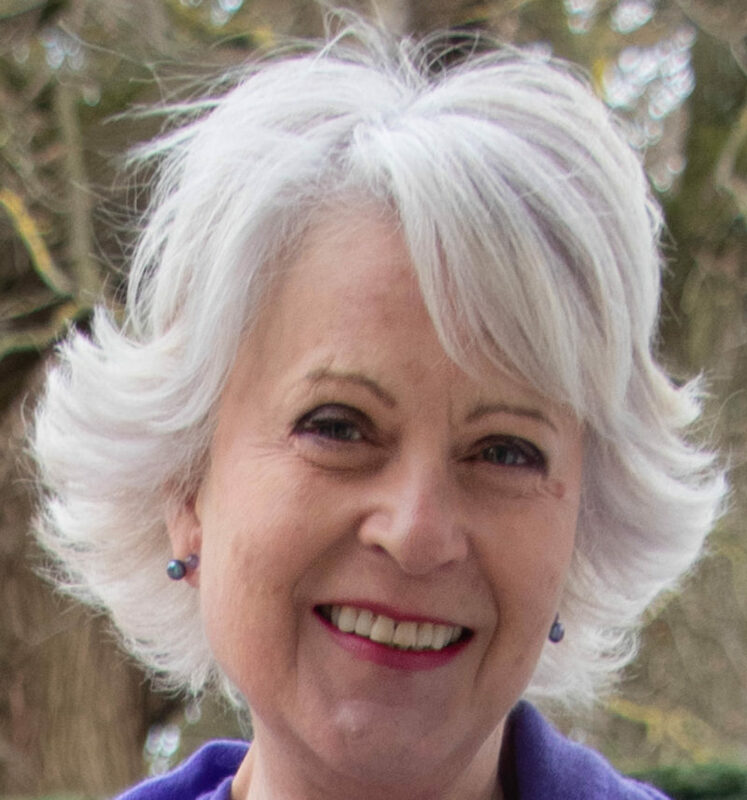 What I have been discovering recently is that the colours that suit me and that I am drawn to have changed since I became older and my hair went grey. I used to wear softer tones but now strangely I can carry off the brighter hues. So it may well be worth your while trying some colours that you might not have thought would work for you when you were younger. We can so easily get stuck in a rut with the colours and styles we choose. Maybe it is time to be a bit more adventurous, or possibly get a second opinion from a professional or a friend that you trust. 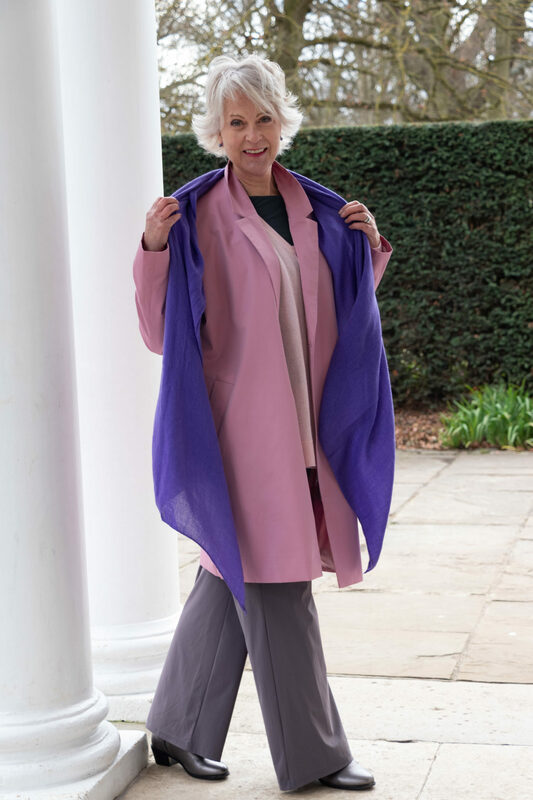 I recently put this to the test and got together with two former friends and image consultant colleagues to have a fun afternoon trying colours by draping fabrics of different colour families around our necks (scarf fashion). We then observed how various colours lifted or drained our complexions. Feel free to wear the colours that you love however you might like to check in the mirror to see if it loves you. This is where I find that scarves and jewellery in your most flattering tones are invaluable worn near the face. They can rescue an otherwise lacklustre outfit and add sparkle to your eyes. As you will notice in the photos I continue to wear and enjoy my favourite colours. They lift my mood as well as my complexion. My new pink coat is by Cos. The description says that it is an oversized blazer style coat in cotton twill with a silky lining. Personally, I would call it a duster coat. There are two things I find it hard to resist one is a duster style coat. I find this style flattering and so useful. You can fling one over a pair of jeans, trousers or skirt for a casual yet chic look. My other passion is pink, definitely one of my favourite colours at the moment. Here I am wearing it over my pink V neck sweater by Hopefashionuk and a pair of their foundation trousers in grey. (both now reduced in their sale). Finishing touches are a pair of metallic ankle boots (a few years old by Vionic) and a purple wool scarf from St.Tropez. Change the accessories change the look. From formal to more casual. 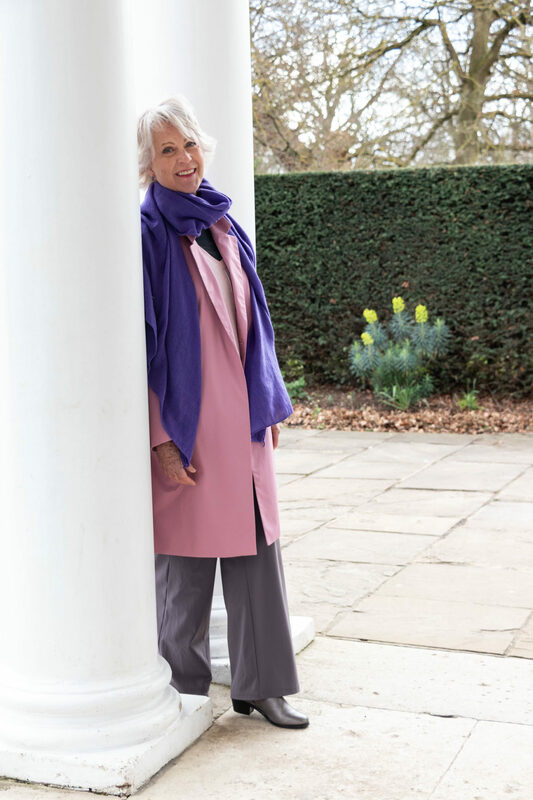 Above I am wearing my pink coat worn over my purple polo neck sweater by WinserLondon, my Levi jeans and a pair of white trainers. I like to be brave with my colours. Here I am combining purple, pink and green. Previous Post Shall we wear purple? It was difficult to part ways with some of my favorite colors when my hair started to go gray. They weren’t loving me back. The thing is, I can wear colors now that didn’t love me way back when. It is so important to look in the mirror and make a change. The process was difficult, though. Everything in my closet seemed wrong. I was one of those spring people who could wear warm or cool, but with my golden hair tones gone, cool it is. I will alway love purple, in a different tone now. I will wesr “my” colors as trends come and go. Did you see THE SEQUINIST POST this week! ?ALL ABOUT THE COLOUR CONSULTANTS that drape the scarves! Yes, I did very interesting. I did this for a career for about 20 years. Hi, I enjoy reading this page. Can you tell me what height you are? 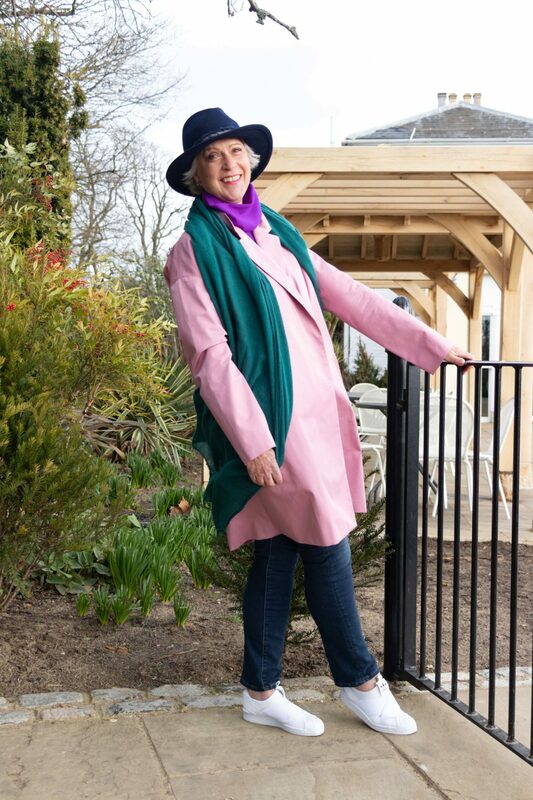 All the items look fab on you but I wonder if they would suit me, given I am 5’4” and inverted triangle shape! I am 5ft 7ins. I think that a duster coat would suit you. 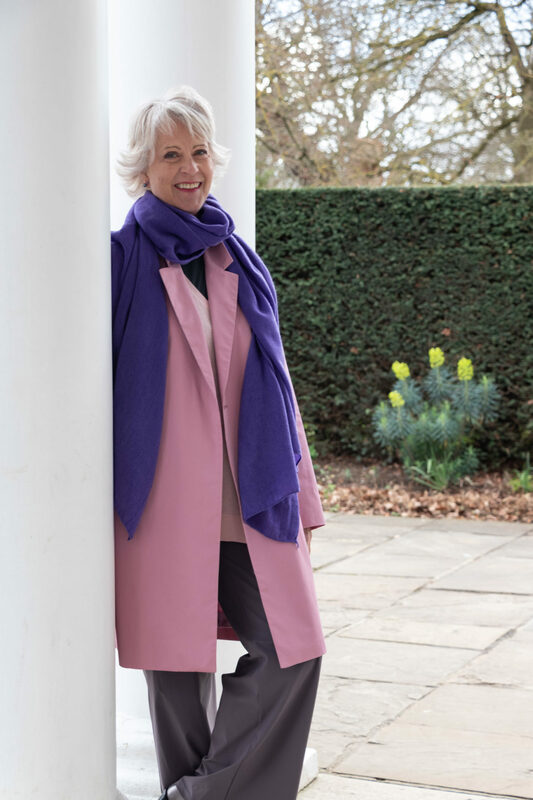 If you have a large bust the purple polo neck sweater I wore in the last post would probably not work for you however it is available in a V neck version. If you go to the HopeFashionUK website they use real models so you can see the styles on various body shapes. 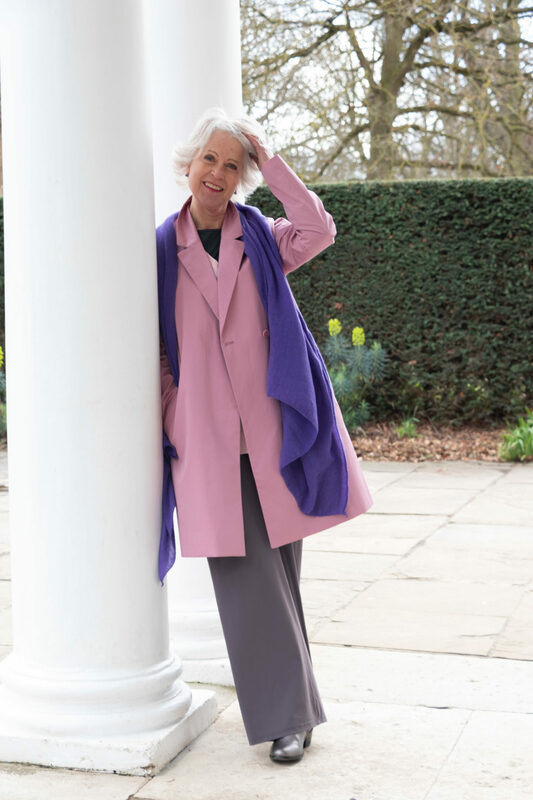 Love a duster coat, very useful for spring in the uk as there’s plenty of room for layers! I also love purple, the deep one in the blue end of the spectrum is my best. I think it’s called imperial purple.I take particular pleasure in wearing it knowing that for so many centuries as one of the common folk I would have been forbidden it and in some centuries executed for my crime! It’s no wonder purple generates strong reactions. Wow, that is a bit drastic. I did not know that you could be executed for wearing purple. I know our times are turbulent but maybe we should be grateful that we did not live back then. I believe it was Cyrus, a Persian king that first wore purple first as a sign of royalty. Tyrian purple was worn by Roman emperors and was very, very expensive. Some Roman emperors threatened death to anyone else that wore purple. Maybe I should follow your good advice and be more adventurous with colour. Thank you for sharing this information. Cobalt blue is definitely going in the purple direction however without seeing the exact tone I can’t say if it is truly in the purple family. Glad it works for you.